Click here to download our free lookbook that’s packed with our favorite email newsletters. That interest is garnered almost wholly on the subject line of the email (with the sender name playing a role, as well). We’ve written a few blog posts about crafting email subject lines, including one on the anatomy of a great subject line and one showing 18 examples of awesome subject lines from brands. Here’s a distillation of what you need to know to write some excellent copy. Compare that with Email B from Banana Republic. The goal of this email is to sell shorts, but the copy isn’t just shoving shorts down the recipient’s throat. I mean, they’re shorts … big deal, right? 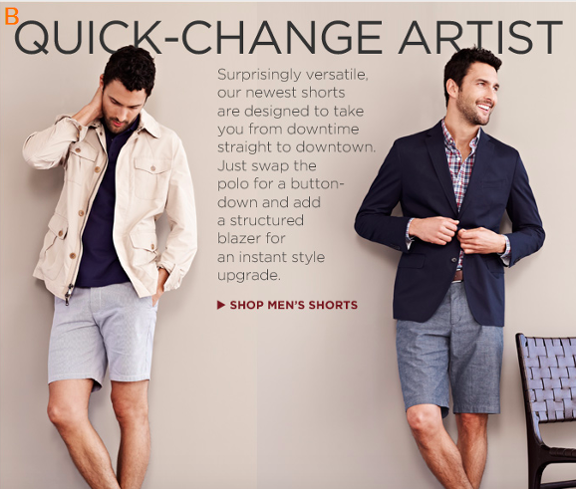 They’ve identified what makes these shorts worthwhile: their versatility. They allow a man to lounge around the house and then go out in the city while putting minimal effort into changing his outfit. How convenient! How easy! How versatile! Postmates doesn’t wait to get to the point. 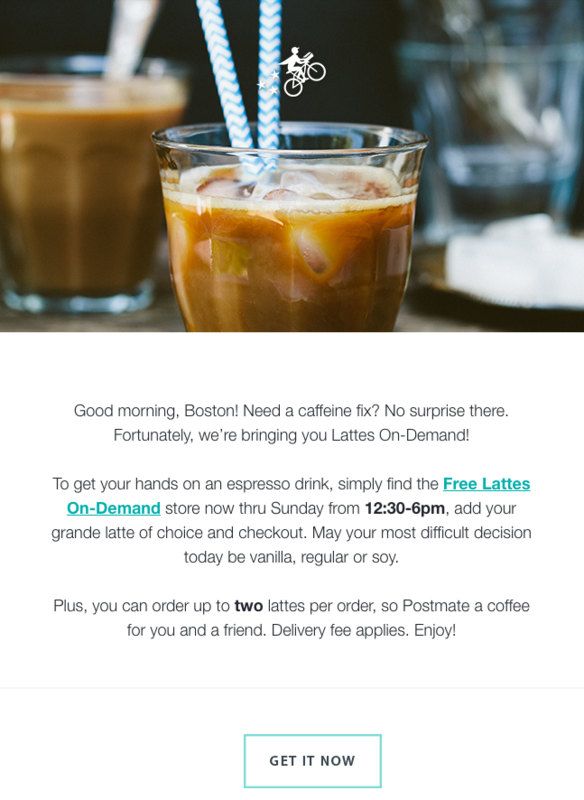 After a brief, friendly hello, they get right down to the purpose of the email: telling customers about their new “free lattes on-demand” promotion. After introducing the concept, they offer a few of the essential details, then get right to the call-to-action. Keeping your message on-point is the key to writing brief email copy. What’s the point you’re trying to make with your email? If you know the action your email is supposed to drive — recipient orders free lattes on-demand, recipient remembers to buy their Bruce Springsteen tickets, recipient gets motivated to work out — then you’ll have a much easier time drafting succinct email copy that remains focused on that one end goal. If writing succinct email copy isn’t enough of a motivator for you to narrow down your goals, remember that having just one primary call-to-action in your email marketing results in better clickthrough rates than emails with competing calls-to-action. 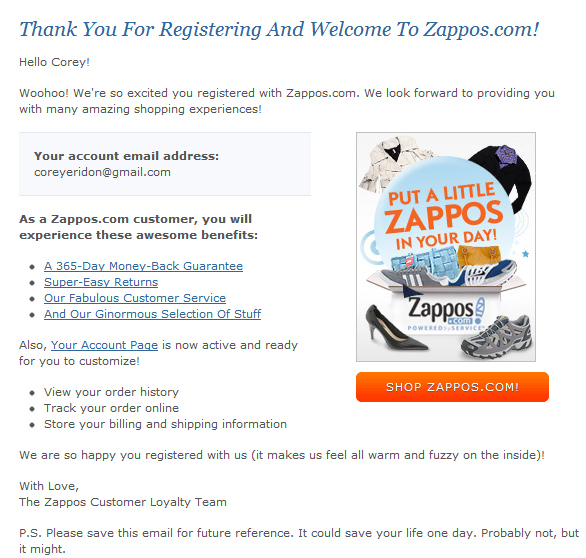 Just because emails are meant to inform doesn’t mean they can’t also delight. In some cases, email can be a great avenue for letting your brand’s personality shine, helping you build a meaningful relationship with the folks on your email lists. After all, providing a lovable experience for people begins and ends with how you communicate with them. Notice the part of the email that’s called out in red. Using concise, personable language, they explain what happened, apologize for the mistake, say what they learned from it and how they’ll prevent it from happening in the future, and give the recipient several options for following up. The format of this portion of the email is optimized for the large number of recipients who are likely skimming the email. The bold text and one-sentence paragraphs make it easy to follow. Finally, they aren’t afraid to add some personality using phrases like “Give us a wavvveeee” to humanize their brand. The result? Recipients are probably much more open to forgiving them for the honest mistake. That’s right: Emails have calls-to-action, too. Well, the good ones do. 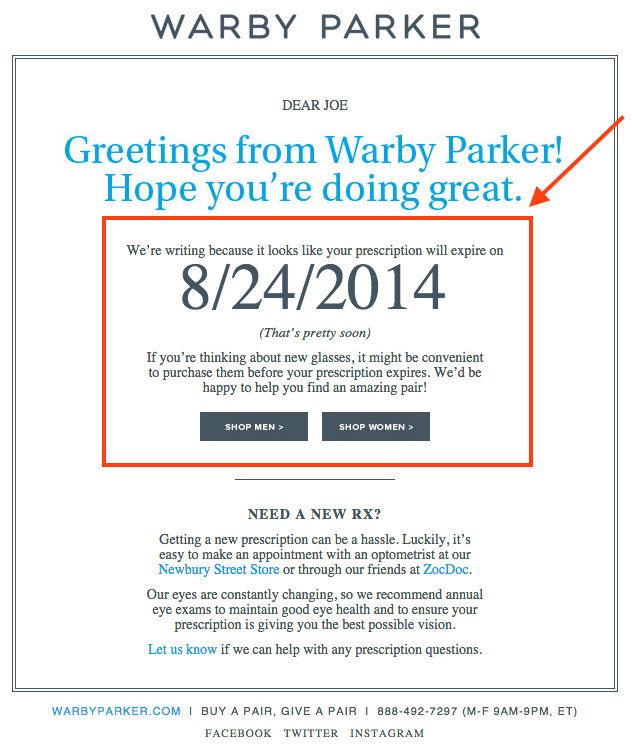 First and foremost, your email call-to-action should be extremely easy to identify. Remember: People scan their emails. If there’s one thing you want your recipient to pick up on, it’s your call-to-action. If you’re sending an HTML email, you may decide to include a button, like this AmazonLocal email did below. Great design: First, notice how the large, bright orange button stands out from the blue design; that call-to-action certainly isn’t hard to find. Great copy: The copy on the button is just as important. Your call-to-action button should include language that is succinct, clear, and action-oriented. 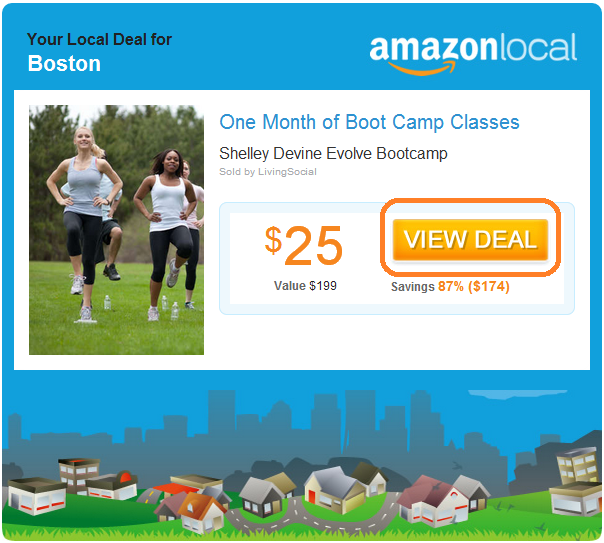 This AmazonLocal button tells you in very few words what you can do using verbs — you can view the deal showcased in the email.